One of the Midwest’s most sought-after a capella groups, Tonic Sol-fa, appears in concert at Jussi Bjorling Recital Hall on the Gustavus Adolphus College campus in St. Peter on Saturday, November 4 at 7:30 p.m. This performance is part of the Gustavus Artist Series. Tickets are available by calling the Gustavus Ticket Center at 507-933-7590. Tickets not reserved before Saturday will be on sale in the recital hall lobby one hour prior to showtime. This pure a cappella foursome has been entertaining audiences throughout the Midwest for the past 11 years. The quartet from the Twin Cities is determined to take this most traditional of all musical expressions, the human voice, and make it the next big thing. In their years together, Tonic Sol-fa has established itself not only as the most in-demand vocal group in the Midwest, but also as one of the most successful independent acts in America. They have appeared on the Today Show and Garrison Keillor’s Prairie Home Companion. 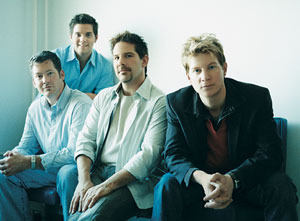 In addition to substantial CD sales of its own independent releases (1,000,000 copies sold), the group has toured extensively throughout the US and abroad. Tonic Sol-fa appears at Gustavus as part of the College’s annual Artist Series. Tickets can be purchased by calling the Ticket Center at 507-933-7590. Tickets unreserved before Saturday, November 4 will be available for sale at the box office in the recital hall lobby at 6:30 p.m., one hour prior to showtime.